The Burnout Zone at Summernats 31. Photo: Peter Norton / Epic Sports Photography. Police have laid down the law for this year’s Summernats car festival, warning participants and visitors that breaking the road rules or bad behaviour will not be tolerated. The four-day event starts on Thursday 3 January with the traditional high-profile City Cruise down Northbourne Avenue between EPIC and Civic, where police will guide the participants along the cruise route. Searing heat is forecast for the event with extreme UV on all days. Friday is expected to be sunny with a top temperature of 37, with Saturday forecast to be 36, with the chance of some relief in the form of a storm late in the day. 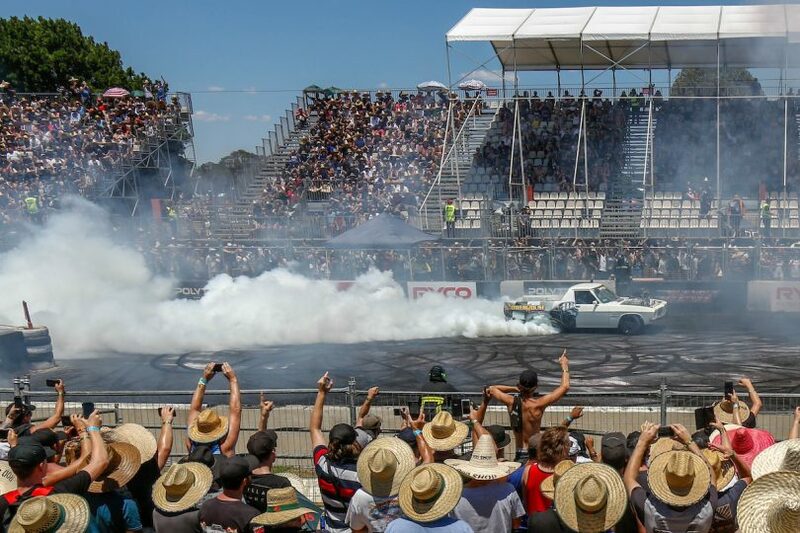 ACT Policing Operational Commander for Summernats, Acting Station Sergeant David Wills, said that while there were some opportunities for activities such as burnouts in designated areas within the event grounds, road rules still applied everywhere else. “In addition to the regular laws of the road, a further reminder that everyone – participants, spectators and exhibitors – should apply the laws of common sense and drive safely, not just within EPIC but on the ACT road network,” he said. “We want the thousands of people who attend Summernats to do so safely. That message applies equally to those who are there for the social activities as well as to people behind the wheel. Officers will also be out in force patrolling other parts of Canberra, including entertainment precincts and venues that are popular during the event. Transport Canberra and City Services has advised that there will be a number of road closures and changed traffic arrangements in place for the event, including the City Cruise. Sections of the Federal Highway and Northbourne Avenue will be subject to rolling closures from 11:45 am to 1 pm on Thursday 3 January, from Flemington Road to the intersection of London Circuit and Northbourne Avenue. These will shut intersections along sections of the Federal Highway and Northbourne Avenue as the cruise passes and cause delays. Road users should seek an alternative route. In the city, Lonsdale Street will be closed between Cooyong Street and Girrahween Street from 10 pm to 1 am on Friday 4 and Saturday 5 January. It will be closed to general traffic but remain open for pedestrians and local residents. Delays are expected in the area and motorists are advised to seek an alternative route where possible. The road may be closed earlier if ACT Police deem it necessary for the safety of the public. Other street closures include Flemington Road between the Federal Highway and Randwick Road between Thursday 3 and Sunday 6 January, Stirling Avenue between Knox Street and the Federal Highway from 10 am on Thursday 3 January to 7 pm on Sunday 6 January, and Elouera Street between Torrens Street and Mort Street from 10 pm to 1 am on Friday 4 and Saturday 5 January. Again delays are expected, and alternative routes should be sought. All Transport Canberra bus services travelling between Gungahlin and the city will still operate. For more information, visit www.transport.act.gov.au.